This recipe for homemade Hungarian sausage or hazi kolbasz (HAH-zee KOOL-bahss) is made with pork shoulder, garlic, salt, pepper, and paprika. Hungarian sausage recipes vary by region and personal taste. Some cooks add a pinch of cloves and lemon zest to their mixture. Make sure not to trim all the fat off the pork, otherwise, the sausage will be too dry. For stuffing techniques, check out how to make Polish sausage. The biggest difference between Hungarian and Polish sausage is the former is never boiled, just baked or sautéed. After rinsing hog casings, store in the refrigerator until ready to use. In a small bowl, mix garlic, salt, pepper, paprika, and water, and set aside. Cold meat grinds more easily, so keep the meat refrigerated until ready to grind. Coarsely grind the meat in a hand-cranked or electric grinder. Place meat in large bowl. Combine water-spice mixture with meat until thoroughly incorporated. To make sure the seasonings are just right, fry a small patty and taste. Some people like to refrigerate the meat mixture, covered, overnight before stuffing so it flavors, but that's not necessary. Remove casings from refrigerator and knot one end. Lightly coat the stuffing funnel with cooking spray or some leftover fat from the pork. Slip the other end of the casing over the mouth of the funnel. Continue to push the remainder of casing up onto funnel until you have reached the knot. Begin to force the meat into the casing with one hand while using the other hand to control the thickness of the sausage as it is extruded. Remember, the sausage will shrink when it cooks, so you want a nice plump sausage. But be careful you don't overstuff or the casing will burst. Keep extruding until the casing is used up. Tie a knot in that end. 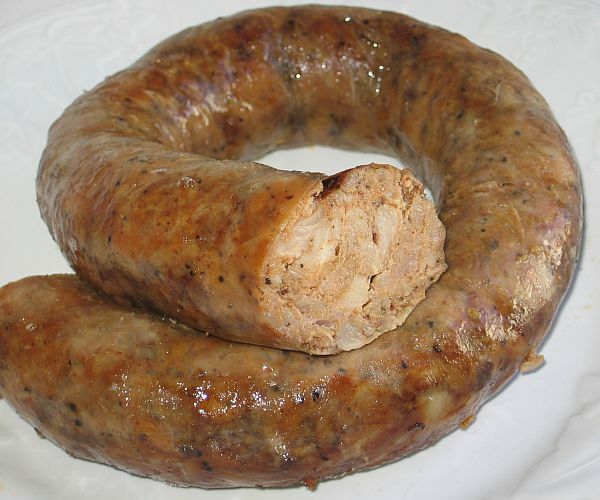 You can either leave the sausage in a large coil or twist it at 6-inch intervals to make links. Use immediately or store sausage refrigerated and covered up to two days until ready to cook. To cook, heat oven to 350 F. Place sausage in a greased baking pan or casserole dish with a little water (or beer). Bake about 1 hour or until sausage is browned, but not dry. Freeze uncooked or cooked sausage for up to 6 months.